Aisha says: Pray at the Grave of the Prophet (sawa)? There are many hadiths where the Companions would indicate that Tawassul was a part of the Sunnah and was not considered a bid’ah/innovation. 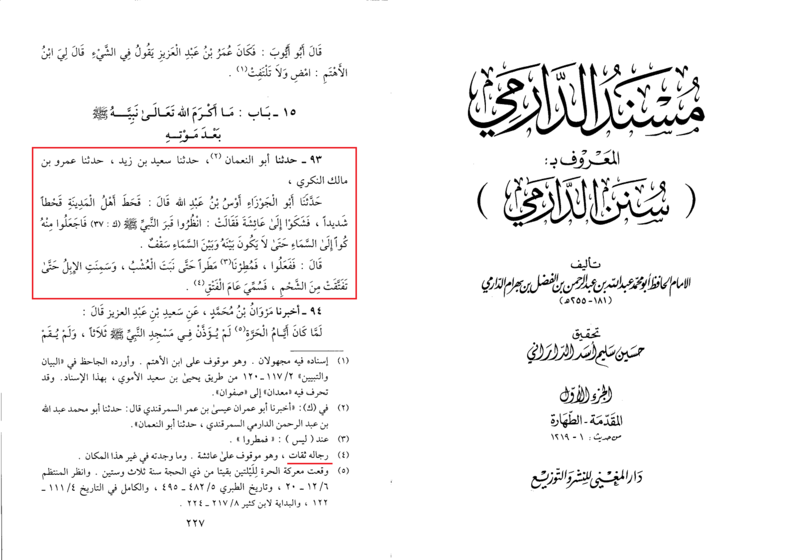 One of these is the Authentic Hadith (by Sunni standards), where Aisha tells the people of Madina to pray at/through the Grave of the Holy Prophet (sawa) – found in one of the important authentic books of the Sunnis. A strong drought fell upon the people of Madina, so they sought council with Aisha. She said: “Look towards the Grave of the Prophet (sawa) and use it like a window towards the Heavens, so it is as if between the Heavens and the Grave there is no roof or barrier. (The Narrator) said: They did this, and it rained such a rain that the grass grew, and the camels grew so fat that it seemed they would burst from their stomach – so they named this year, the year of plenty. A Question we raise: Is this from the Sunnah or is Aisha the first of those who create the bid’ah/innovation of “grave worshipping” ?? In any case, why do our brothers attack the Shia when their mother ordered the People of Madina to seek tawassul through the Grave of the Prophet (sawa)?